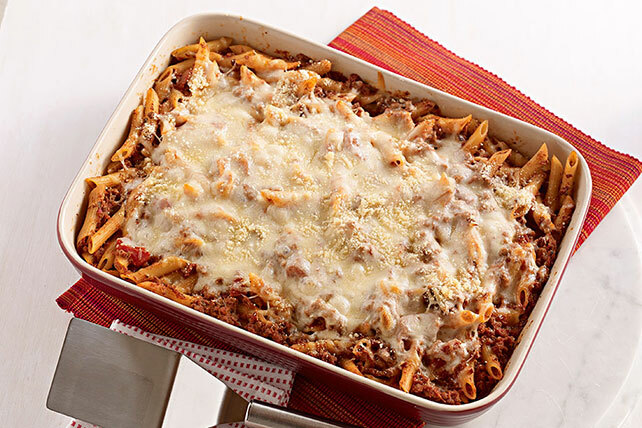 This hearty BOCA Pasta Bake is a quick and cheesy recipe, with a prep time of 20 minutes and two delicious melty cheeses. Combine pasta, sauce, crumbles and 1/4 cup grated topping. Spoon into 13x9-inch baking dish sprayed with cooking spray; top with mozzarella and remaining grated topping. Add 1 pkg. (10 oz.) frozen chopped spinach, thawed and well drained, to pasta mixture before spooning into prepared baking dish.